We specialize in the hospitality industry. If you are thinking to start up in the hospitality industry, how can you get your business off to the best start? Are you thinking about a quirky cafe, or is your plan to offer high-end dining? Envirotek can help. The first step to any great restaurant is a proper business plan. At Envirotek we take the time to build a plan that will refine your concept and articulate all areas of the business such as estimation, projection, cost of food, cost of labor etc. This accompanied with location research will boost your success rate in securing a profitable business. We don’t just say it on paper, but will be with you every step of the way, from negotiating the right price for a purchase or lease takeover, whether it is a new location or renovating an existing one. Our industry experience in restaurant design and consulting means that we have a formulated procedure on how to start a project of any size. We say this because many of our clients unfortunately make that expensive mistake of going into it alone before actually hiring a consultant. Our expertise will allow you to tap into our superior network of contacts. We work with the best restaurant designers, contractors, architects, trades man and industry professionals to make sure your business is built the right way and most importantly ON TIME! Once you have the process of building or renovating your space out of the way, we help focus on the interior and suitable equipment for your operation. We offer everything from kitchen equipment & supplies, to furniture, fixtures, memorabilia, and even custom fabrication or mill work. We have a constant connect with reputable suppliers that secure you better quality and prices for kitchen equipment, bar supplies, small wares etc. Allocating funds and working within budgets is what we do, we offer prices within seconds for optimizing the best collection of purchases for your business. Our network allows us to setup your business in a very pristine manner, while educating you of all the procedures, systems and policies. We start of creating a corporation and then aligning all the sectors that we have to divide and conquer such as health & safety, fire Marshall testing, how to correctly pass building code, completing liquor board inspection, kitchen ventilation code and so on. Starting a business might be overwhelming at times but Envirotek Solutions has a certified handbook on the best way to open your business as soon as possible. We help you stay focused and enforce these necessary policies and procedures so you keep your eyes on making money. We know that a restaurant doesn’t just start to pick up as soon as we open. We stay well into the weeks of opening to assist in the opening and even train staff to properly operate all of the necessary equipment. Envirotek Solutions provides you assistance throughout the entire duration of your business construction, from pipework to cutting the ribbon. Going forward, our customer relations department will always be in touch with your business and you. We work on a real personal level with our clients and are proud to say that we enjoy coaching and mentoring businesses across Canada. We work with business owners to constantly improve their skills and business ensuring both professional and personal development. Being an operator/owner of a successful restaurant can be a tremendous feeling. It takes a lot of experience to undertake such a journey. 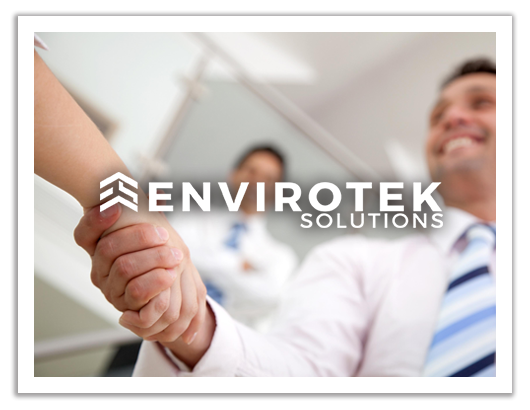 The team at Envirotek solutions has almost worked in the industry for over 30 years. We have the knowledge, experience and support to make your ideas into a great business and it all starts with an initial meeting. We know that you have worked hard for the money you are about to spend, and your investors probably want to see that you will make money also. We can definitely do this by implementing our systematic thinking and careful evaluation of the business, such as customer spending, cost forecasting, product labor costs and accurately identifying your initial start up costs. Click below to get in contact and begin your business plan.